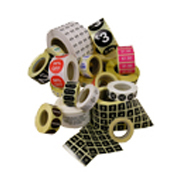 Established in 1983, Brenell Labels has grown for over 25 years in a very competitive market place. We are a family run business that aims for friendly, personal and professional service. If your label requirements are not within our standard range, please contact us and we will be pleased to discuss your design with you. The labels displayed are but a small selection of our printing range. Please call or email to discuss your specific label requirements.